I fell in love with wine at the age of 19 whilst working at a small hotel near where my parents lived in Dorset called The Kings Arms at Charlton Horethorne. I was presented with a glass of 2006 Spice Route Winery Chakalaka and it completely changed my life. Soon after that I discovered that my late godfather (Kit Stevens) was a Master of Wine. 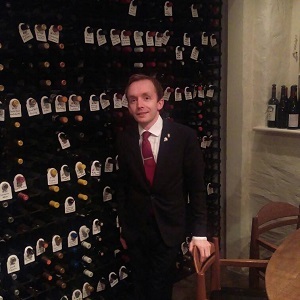 I soon afterwards joined The Ritz London sommelier team where my first mentor Tobias Brauweiler MS took me under his wing and taught me everything he knew. He was very thorough and always keen to get the best out of his team and I’m very grateful for what he taught me. He also got me through my Court of Master Sommeliers Certified exams. I have had many mentors over the years who have helped me and showed me new ways of working… I am very grateful to all of them for getting me where I am today. A Sommelier should be humble, kind, open to new ideas and always willing to go the extra mile. There should be a natural thirst for knowledge and the willingness to become better each day. For me that person was (and still is) Pierre Brunelli (Head Sommelier L’Enclume)…. He taught me that although it’s important to have plenty of knowledge, it’s also important to remember who you are and always be yourself and have fun – “Sommeliers are Rockstars”! Get yourself into a reputable restaurant which has a strong and diversified wine list. Attend as many tastings as you can fit into your schedule and introduce yourself to as many people as you can… remember being a Sommelier isn’t just about talking, it’s mostly about watching and listening – you can learn a lot more by doing that. Remember there is always somebody who knows more than you. Listen to your Head Sommelier and throw yourself at their mercy. They are there to help you and want you to succeed, and always keep asking questions!!! Always be open and honest with them. Be kind and approachable. Try and find something to relate to them with and make it as fun as possible. Never be condescending, never think you know more than they do. We use Riedel at The Forest Side. I enjoy the simplicity of the glassware and the generic use that we get out of them at the moment. We are considering moving over to Zalto soon. Always consider the most important component of the dish. Say if you have a pork dish served with a garnish based on tart apple then pair the wine to go with the apple – such as Radikon Chardonnay Orange wine or a dessert made of caramelized parfait, goats cheese mousse, parsnip and sorrel syrup I pair a devon cider! Be willing to experiment and try something against the grain. I expect my sommeliers to understand what they are serving to be able to recommended styles of wines that guests are looking for so yes I firmly agree with sommeliers tasting the guests wine. Where would you suggest a young Sommelier, start searching for Sommelier positions on the internet in your country? Oh it’s gotta be Cabernet Franc (no question) – it can often be difficult to understand, difficult to fit in and finds it hard to fit in with the crowd to be, but when it’s made perfectly it can be charming, seductive and full of so much character that you finally get who it is. Let it age a bit and you’re in for a real treat. What are the top 3 types of wine (your faves) we would find in your home wine collection and what’s your desert island wine? Desert Island Wine – 2006 Spice Route Winery Chakalaka, Swartland, South Africa. Love reading decanter and Guild of Sommeliers, a great resource for any sommeliers working in restaurants, it’s full of information and great for studying & exams.